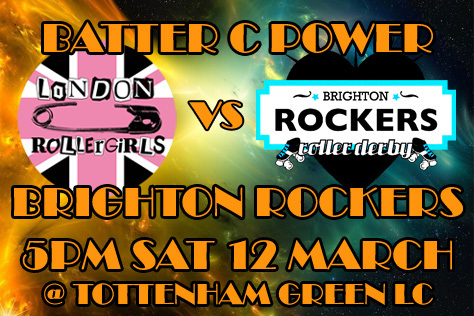 After their recent European adventures (which you can read about HERE) the mighty Brighton Rockers are back in action on British soil this Saturday 12th March. Tottenham Green Leisure Centre in North London is the venue and the Rockers are taking on the London Rollergirls third team Batter C Power. It’s a double header – LRG’s Season Opener – with the London league’s second team Brawl Saints facing the mixed league LGBTQ challenge side Vagine Regime UK. Doors are at 4pm with Brighton’s game first up at 5-6.30pm, then the second game at 7-8.30pm with an after party to follow. Tickets are £15 (plus a small booking fee) for adults and £7.50 kids from the link at the bottom of this piece – online sales end midday Friday, but there will likely be A FEW tickets on the door. Getting there is easy enough as it’s the only weekend this month with no engineering works on the Brighton mainline. Of the various possible routes the simplest is probably a train to Victoria, 15 mins on the Victoria line to Seven Sisters, then a ten minute walk up the A10. A super-off peak one-day travelcard is about £19 these days (£12.50 with a railcard) from Brighton and Hove stations. Car users should point their sat navs at N15 4JA. Pubs are few and far between (the nearest is a good half mile from the venue) but there are millions of takeaways in the area. Usually the only facilities at the leisure centre itself are a couple of vending machines, but there will be a bar etc for this event. 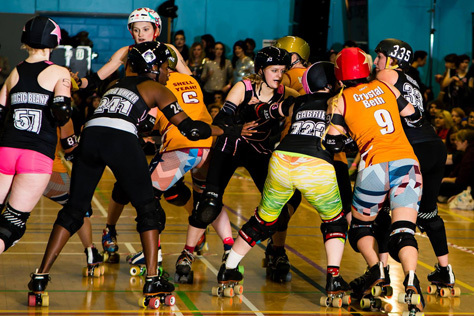 Brighton played against Batter C in the Rockers’ late lamented Shoreham warehouse in February 2012. The Rockers won that one 223-192 but both teams are very different now. Flattrackstats.com gives the Londoners the edge here. Batter C currently place 47th in Europe on 615.4 ranking points with Brighton 69th on 576.1. FTS gives the former 80% chance of taking the win here. Expected differential of 8:5 suggests a scoreline in the region of 168-105 to the London side. Unfortunately FTS doesn’t give rankings for exhibition teams like Vagine Regime, so there’s no prediction available for the event’s second game. However, VRUK beat Brawl Saints by the narrowest of margins (133-130) at the same venue last May. If that’s any indication then this rematch could be SUPER close! The Rockers kicked off their 2016 open door season a few weeks ago at a tournament in Normandy. How did that go? What did you bring away from it for the rest of 2016? We had a great time in Caen. Lots of players were playing some of their first games with the A-team, so it was a really good chance to get used to playing with each other and to try out some different line-ups. We went without expectations (except that we would win the after party) as we know the European rankings don’t necessarily reflect how teams are actually playing. We had some fantastic close games which could have gone either way and have learnt loads. I’m sure you’ll see some newer players in A-team games more often, as well as some exciting new tactics, in the rest of 2016. And obviously we did win the after party! You take on Batter C Power in Tottenham on Saturday. Presumably a lot has changed since Brighton last played Batter C four years ago? Are any of those who debuted for the A-team in Caen likely to feature on Saturday? Are there any particular players or tactics that fans should look out for? We’re taking quite a small team to Tottenham. Partly this is due to injury – LRG are super organised, so we actually had to select Saturday’s roster before Caen! This also means a few new players who really shone in Caen haven’t been included, but it doesn’t mean they aren’t awesome. The team we’re fielding know each other well and have lots of game experience together. I’m sure fans have their favourite Rockers, but Gin’s massive hits are always fun to watch (and less fun to receive). I think it’ll be a close, hard-fought game, but I guarantee we’ll have a lot of fun! Saturday’s other game sees London Brawl Saints taking on Vagine Regime UK. How do you see that contest going? I’m sure Brawl Saints will utilise some of the tactics we’ve seen from Brawling in Malmo this weekend, and will be using diamond wall formations to keep jammers trapped. Both teams have some great players at a very high level (and some players have featured for both teams) so I reckon it’ll be just as close as last time – a real nail-biter. Finally, any other Brighton Rockers games that fans should look out for over the next few months? Our next home event is on Saturday 30th April and will see the A-team take on Newcastle B whilst the B-team face the Hoodlum Gang (a mixed league team set up by the Hoodlum Fang fashion label). This double header should show off everything derby is about. We have another home event just three weeks later on Sunday 22nd May. Although we haven’t yet revealed the opponents for this one (keep an eye on our Facebook page for details) tickets are already on sale as the event is part of Brighton Fringe. We’ll also be arranging some more international games later in the year. Normally we start off by asking the opposition to tell us a little about their league. We’re pretty sure everyone reading this knows who LRG are, so could you tell us a little about Batter C Power in particular? Batter C was formed around 2011 when it became obvious that the league was large enough for a third travel team and there was scope for a C-team that could compete with other local leagues. We compete with similarly ranked A and B-teams in the UK and Europe. In the last two years we have played a B-team tournament put on by Central City in Birmingham and we are proud to say we won both times. We’ve also been able to play a few double headers with Brawl Saints playing a league’s A-team and us playing their Bs. It’s always fun to travel with the other teams – league bonding at its best! We train and scrimmage with Brawling and Brawl Saints, although we have a weekly session that is more geared towards us (and they have one geared towards them). Most of Batter C have come up from our Rec League and we try to go and scrimmage with them once a month if possible. Batter C played the Brighton Rockers in 2012. Are there any players from that game involved on Saturday? Any Batter C players in general that people should look out for? Actually, not a single player from the 2012 game will be playing against Brighton on Saturday. However Sophia Ann Loathing who played in 2012 can be seen in the day’s other game, playing for and captaining Brawl Saints. We like to pride ourselves on our team work, so singling out a player doesn’t feel right; however we have a brand new line up manager in TreeKill Tart and this will be her first LRG game as LUM so look out for her! Also we recently voted in new captains, so watch how wonderful Aura G and Baby Cheesus lead the good ship Batter C.
Do you know much about the Brighton side? Any Rockers players that you’ll be looking out for? We have heard that playing Brighton is great fun and very challenging, and that they are a very friendly team to play. We always look forward to games and the smiles between hits really elevate things! We’re particularly excited to see former LRGers play. Racey used to be a member of Batter C and Obliviator did her Fresh Meat with us (and played for the Rec League) so we are excited to see and play against the two of them especially! The day’s other game sees Brawl Saints taking on VRUK. Are you expecting this one to be as close as last year’s meeting? It’s hard to develop strategies when playing challenge teams, it’s always an unknown. The last game was a tough one with a number of very skilled skaters on the roster and this one looks equally challenging. Brawl Saints have got a lot of new players so will be trying out some new tricks and tactics for this game. Home games always have a great buzz, so we’re hoping to channel the enthusiasm of our supporters to bring home the win. Finally, can you tell us a little about the Tottenham Green venue? Will there be plenty of seating and vendors etc? Most importantly – will there be a bar? 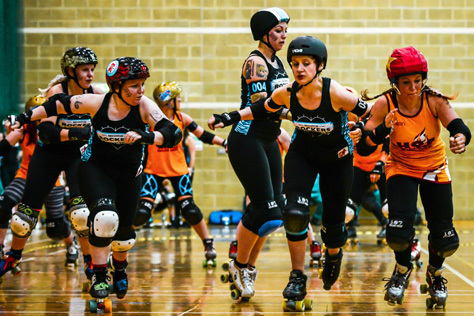 Tottenham Green is a wonderful venue that has supported roller derby for a long time and while it’s not the perfect venue – we don’t have tiered seating for example – it turns into “the place to be” when it is full of fans. We will indeed have a bar – so get your designated driver ready and come and enjoy a drink (and a donut) or twelve! Opening the home season with these two games is going to be pretty special in itself, but as always we will have a raffle with great prizes. We have new DJs and there will be a fabulous after party at a pub nearby. We can’t wait! This entry was tagged Brighton Rockers, London Rollergirls, roller derby, roller skating, sport, UKRDA, Vagine Regime UK, women's sport.